Selling Your Motorhome? Call us NOW!!!! 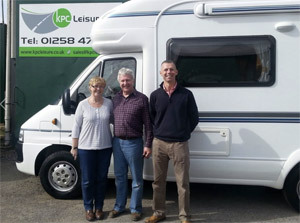 Here at KPC Leisure Limited, we are always looking to buy good quality used motorhomes and campervans and pay the best price for the best vehicles, and have cash ready to purchase your pride and joy. The company is also pleased to offer a ‘brokerage’ service, selling your motorhome or campervan on your behalf. This service makes selling your vehicle a simple process without difficulties or hassle. Use over 30 years of motorhome industry experience to sell your van! Here's what our customers say. "Jim and I would just like to thank you for your help and advice in selling our VDub, the whole process was made so easy and painless! It was such a relief to have it all taken off of our hands, and dealt with by you guys.... and so quickly too. Happy to report the funds are now safely tucked away , they arrived a short while ago, thank you. Jim and I would have no hesitation in recommending your services to our friends and family "
"Thank you again for your efficient and friendly handling of the sale of my Autosleeper, I really do appreciate everything that you did." "Thank you very much, we have been very impressed by your service and ethos. We will spread the word." "Thank You, I've now received all the money. Thanks again for a job well done." "Funds have been received. It has been a pleasure doing business with you, many thanks for your efforts." For more information please call Kris or Paul on 01258 470187, or use our contact page to get in touch.